in Pretzel Cable patt on larger needles. 7 1/2" wide and 63 1/2" long. -Finished Size: 7 1/2” wide and 63 1/2” long. -Yarn: Blue Sky Alpacas Techno (68% baby alpaca, 10% extra fine merino, 22% silk; 120 yd 109 m/1 3/4 oz 50 g): #1971 metro silver, 5 skeins. -Needles: Size 10 (6 mm) and 6 (4 mm). Adjust needle size if necessary to obtain the correct gauge. -Notions: Cable needle (cn); tapestry needle. -Gauge: 23 sts and 28 rows = 4” in Pretzel Cable patt on larger needles. 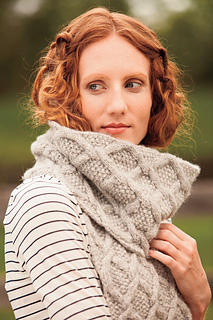 Wide and cozy scarf with raised and well-defined pretzel cables and ribbed edges.